Harman/Kardon is a company founded by Dr Sydney Harman and the late Bernard Kardon, way back in the early fifties. It belongs to a very select circle of what could be called "The Audio Industry Founding Fathers" group of companies, together with other greats, such as Marantz, Fisher, JBL, Klipsch, Altec and so forth. In 1953, H/K invented the receiver, and from its early days, pioneered the philosophy of wide bandwidth and low feedback design. 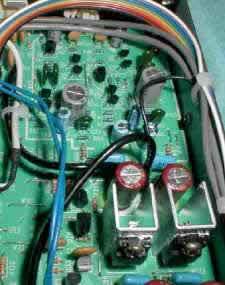 In the seventies, this company enrolled the services of one of the legends, and perhaps THE legend of amplifier design, Dr Matti Otala, whose work is embedded in modern amplifier design. Also, the company has grown to the point of being the owner of many audio companies throughout the world, such as JBL, Infinity, Madrigal, Mark Levinson, Proceed, Studer, AKG, Becker, etc. To this very day, the company is majority owned and managed by Dr Sydney Harman, a man who deserves the epithet of being quite unique in the audio world. I have to say it, just in case somebody didn't notice - I greatly admire and freely admit to being very strongly influenced by this company's philosophy and technical solutions. That is why I admire them on the one, and criticize them so strongly on the other hand. I think we all have our "sweet" companies, and H/K is mine, though it is not alone. That said, let's get down to business, and the first item on our agenda is H/K's smallest integrated amp offering, code named, very mystically, 630. Its physical dimensions are modest, 443x91x359 mm (WxHxD), while its mass is moderate at 6.4 kg (14 lbs). It's a bipolar design, well in the economy class though far from being the cheapest around, and with certain audiophile pretensions. It is rated at 40/60W into 8/4 ohms at THD figures of 0.09/0,3%, with dynamic power (as per IHF standards, 1 kHz bursts) ratings of 70/100/135W into 8/4/2 ohms. The manufacturer claims "instantaneous current capability" at +/- 40 Amps, however, without any statement under which conditions (how long is instantaneous?). Frequency response is quoted as "0.5-100.000 Hz -3dB", and half power bandwidth into 8 ohms is said to be "<10-100.000 Hz". Sensitivities are said to be 150mV/43kohms for line level inputs and 2.5mV/47 kohms 125 pF for Phono MM input, which is said to overload at 100 mV. S/N ratio is given as -80 dB for phono and -90 dB for line level inputs, both at rated output power. The damping factor into 8 ohms is said to be 120. Power consumption is said to be 270W. Like previous offerings from this company, this model has tone controls for bass and treble; unlike previous offerings from this company, it also has a tone defeat switch. Well, they took their sweet time including that one! It should have been there ten years ago, and not reserved only for the top model in the range. Another great break with tradition is the inclusion of (argh!!!) 7 integrated circuits - yes, that's ICs. H/K has until recently maintained that only discrete components are good enough, while mass produced ICs just spoil the sound. Right, so they now included what are probably the most mass produced ICs of them all, the ubiquious NJR 45xx series, as well as the original NE5532. Price pressures probably, and anyway, this model is manufactured on Taiwan. To be fair, ICs are used in the preamp only, and then, as far as I could tell by visual inspection alone (no schematics were available), for line level inputs only. Therefore, the phono RIAA input uses discrete transistors, and the power amplifier section also uses only discrete components. 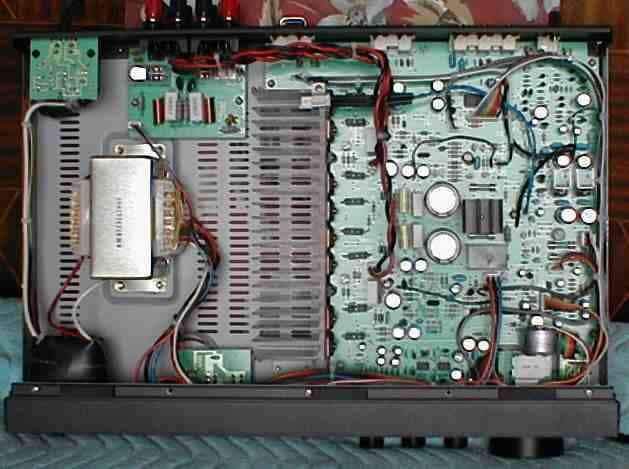 Speaking of the power amp section, here also we see breaks with tradition. At the input, we now have dual transistors (2SA1349, PNP) where discrete single NPN transistors used to be. At the output, instead of a single ended push-pull stage in a triple Darlington configuration, we now have two pairs of power transistors (2SD1148/2SB863, 140V, 10A, 100W, 15 MHz). This I consider to be very important and most welcome - having double the number of power transistors expalins the doubling of the damping factor in comparison with the older models (and removes fears of excessive feedback, even if that never was H/K's style), and also makes the impulse current delivery more credible (I'll never cease to wonder how one goes about pumping much more current than the transistor manufacturer allows for even in impulses, as equipment manufacturers would have us believe). Also new is the system of switching speakers, as you are allowed speaker pair A, B or A+B. Before, they used to run wires from the amp output to the switches on the front, and from them to the binding posts at the back. Now, it's done much more ellegantly and definitely sonically better - speaker pairs are switched by means of relays right next to the binding posts. Another welcome change for the better, even if some, oh, say 15-20 years late - ancient Koerting systems from early eighties used this method even then (and these were people models, not exotica). In the past, I have always criticized H/K for using junk potentiometers even in their upmarket models; now they partially redeem themselves, as the motorized volume control uses a better quality pot, while the rest are still the usual junk. Oh well, you can't win ‘em all, and anyway, this is their bottom of the line model. But, some good traditions have been appropriately carried on. The filter capacitors are still Elna For Audio, rated at 10.000uF/50V, and the bridge rectifier is still a chunky, high current affair, with its own heat sink. Some high grade components are also in evidence, like 1% metal film resistors in critical places, and high quality capacitors here and there. This suggests at least some tuning was done somewhere along the line. Finally, on the back, we still have standard commercial quality phono plugs, but they are now gold plated, all of them - that's good. Now even the small model has pre out-main in U shaped links, a good feature in case you decide to upgrade. Speaker binding posts are still pretty chunky items, also good. Last but not least, the mains cable is captive, but is also of unusual quality - it's relatively massive and confidence inspiring, much better than is usually found on Far Eastern amps of twice its power rating. Oh yes, lest I forget - there's also a remote control and backside jacks for other associated equipment. Convenient, if limited - you can remote control source selection and volume, enough to get by. If this is your thing - and it's mine - you have to let the 630 reach its operating temperature, so be sure to turn it an a good half hour before you do any serious listening. And make sure there's nothing on top of it, as this new kid on the block gets heated up about things. It would appear that it has been biased rather strongly, judging by the heat dissipated. I like that, and so does the music, and therefore, so will you most probably. It won't get suspiciously hot, but you will notice the heat if you put your hand on the top cover. Its sound is in many ways typically H/K - it's fast, almost brisk in cases, with much detail, and tremendous energy behind it. This thing is so alive it almost kicks, and if you don't watch it, it will kick. Just give it a transient and be amazed. There aren't many of them out there who can do this so well. On the other hand, there's something new in its sound which H/K didn't have before in this price class. There's a certain finesse, not amazing, not great, not even surprising, but finesse nevertheless. For example, it will do a deep down bass with no problem at all, but it won't let this reflect on the rest of the spectrum. I know that's what a good amplifier is supposed to do, but not too many at this price can actually do it like this. Unfortunately, this unit will also display fairly typical NE53xx sound, a term I have come to use in conjunction with these chips. I realize they owe much of their popularity as one of the first chips developed for audio which didn't cost an arm and a leg, but I also submit they are inherently shrill. This is to say that their treble is subjectively more pronounced than it should be, and not infrequently, downright annoying. I jave tested this hypothesis on many occasions in the past by simply substituting these with Precision Monolithics' PMI OP275, a chip noted for its rather good sound. Sure enough, every time, now that's EVERY time without fail, the sound came out much to very much better than it used to be. I suspect that the key reason why these chips here come out less annoying than usual is because of 630's very good power amplifier sections, which deliver uncommonly clean and plentyful, yet tightly controlled bass. This is usually not so, and we then have annoying treble with lacking bass, thus pronouncing the treble even more in subjevtive terms. In this case, it's not annoying, but it's not as good as it could be. If other mass manufacturers are using the OP275 (e.g. Rotel), I would strongly advise H/K to try this little test out and see for themselves. I suspect the stronger than usual quiescent current is the main reason for this quality of tone at low levels. Anyway, the sheer quality of the bass lines helps put the amp in better perspective than is common in its price bracket. First of all, this is a superbly fast amplifier - you won't catch it with its pants down with anything short of electronically generated lab tone bursts, which not many of us listen to. But give it fast electronic music, like Vangelis and Enigma, and it will show you how it's done for this kind of money. Its bass lines are firm and full, but not overblown. Its midrange is clear and clean and keeps its perspective at all times right up to the overload limit. Its treble is a little different, though - when you push the amp very hard, it tends to become harder than it should, given the requirements. It doesn't harden up or break up, but it does become a little harsh. It begins to sound less well defined and some imagery is lost, even if the sheer loudness it produces tends to mask this. The bass and midrange are this amp's forte. The drive, the energy, and an almost physical presence of the drummer are not common, and at this price, I can't think of anything remotely comparable. I threw Enigma's Special Edition of "1990" at it and it did its job with aplomb, even at high volume; the same with Vangelis. If you want to hear the cannon shot in "1812" as can be reproduced at this price, give 630 a chance. But do remember, this is notionally a 40W amp. It will also amply demonstrate how subjectively loud even 40W can be, though to be fair, even by manufacturer's specification, it does offer 2,4 dB in dynamic headroom margin before clipping. And H/K are notoriously conservative liars in that respect - whatever they say, you can bet it'll do better, sometimes much better. I use the word "liars" on purpose - in my experience, what they do is design what everyone else would call a 60W amp with a nice margin of safety over and above that, while H/K will call it a 50W amp. So, bless their cotton socks for premeditated lying this way. I couldn't help comparing it with my own H/K 6550, which is a 50W/8 ohm per channel model from early 1994 (which under declared conditions develops 66W, not 50W - see what I mean about lying?). Frankly, on sheer drive, the 630 seems more powerful, at least subjectively, but it looses out on finesse - the 6550 will keep its cool right up to clipping, never missing a beat. Its treble will remain composed and coherent, while the 630 will do a less orderly job of it. Then again, even in its day, the 6550 cost 50% more. If they included it, why not give it a go? So I gave it a go. Using my heavily modified Dual CS604 (yep, a blast from the past, from 1978), equipped with an Ortofon LM20 (now 520) cartridge, I played some of my favorite records. I paid special attention to Decca Phase 4 records, as these provide some incredible stereo. The phono stage, I'm afraid, continues H/K's tradition dating back to my 6550. The stage doesn't have too much or too little bass, too much or too little treble, in fact, it doesn't have much of anything, including color. It makes no obvious mistakes, it's not nasty, or noisy, or, well, anything. It's simply bland, with no discernible tonal color I can make out. It simply works, but that's about all I can say for it. If you're heavily into vinyl, forget this stage and go for an outboard equalizer/amplifier. Never mind that it uses discrete technology and many high quality, 1% metal film resistors, somehow they've managed to make it sound less than the sum of parts would imply. But don't pass this model by just because its phono stage is mediocre, you'll be missing out on its other undeniable virtues. This is a very lively, and occasionally too lively, amplifier, treading on a no man's land between mass produced, everything but the kitchen sink stuff and virtually hand made audiophile designs. It has a somewhat schizophrenic personality, as it combines some characteristics from both sides and can't quite make up its mind which way it wants to go. Its overall behavior is above its immediate competitors, but its high range disorders prevent it from quite making the audiophile camp. pedigree (like OP275, or possibly AD826) and found that the amp had finally crossed over to the audiophile camp (if it were mine, that's what I'd do). Or perhaps H/K will do something along those lines and call it a "Special Edition" or some such, shedding the tone controls along the way too. For the time being, this is an energetic amplifier, built to general contemporary tastes and above the norm, using selected quality components in key places. It's only let down somewhat by its unruly treble, but it offers much for the money. Above all, it's honest, both in presentation and build quality and makes no promises it cannot keep, and then some. All in all, it's worth auditioning, especially if you have efficient speakers and don't require high power levels - it won't let you down, particularly if you're into modern types of music.